A reliable source for Hydraulic Seals information and a resource for accessing leading Hydraulic Seals and suppliers. Hydraulic Seals Hydraulic seals are an integral component of most hydraulic systems. Usually made of some type of soft, flexible elastomer that provides exceptional water and air sealing capabilities, hydraulic seals are ring-shaped and primarily designed to eliminate or limit the leakage of fluid moving within a hydraulic or pneumatic system. For over 20 years, it has been our dedication to service and outstanding product quality in all our hydraulic seals that have set us apart. We deliver high quality products every day, including o rings, metric seals, pneumatic seals, Teflon seals, and a whole lot more. We are not only technically knowledgeable about hydraulic seals, but we also have the hands-on experience to back it up. We have over 30 years of industry experience, and we can use that experience to benefit you. Zatkoff Seals & Packings today is the largest independent distributor of seals in North America.  One location manufactures various die cut shapes from a full range of non-metallic materials and offers the ability to supply most materials with an adhesive backing. Our list of inventory has grown since our founding over 20 years ago. We started small, but now offer an extensive product list of hydraulic seals, o rings, and other rubber products. 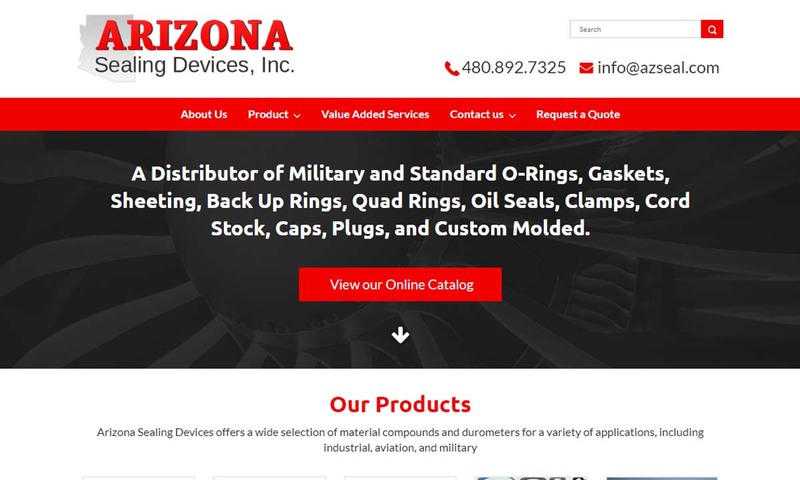 At D&D Engineered Products Inc. we manufacture top of the line hydraulic seals, gaskets, various o-rings, high temperature tapes, compression packings, and much more. Hydraulic seals are generally made from elastomers, natural and synthetic polymers, which possess weak molecular attraction and highly elastic properties. Two major sources for hydraulic seals are rubber and plastics (including PTFE, such as Teflon, and polyurethane). 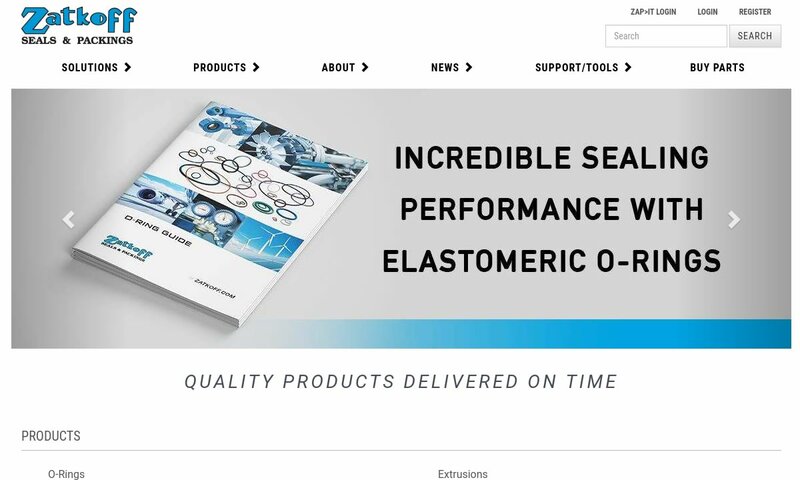 Other elastomer materials used to fabricate seals include butadiene, nitrile, butyl, and silicone. 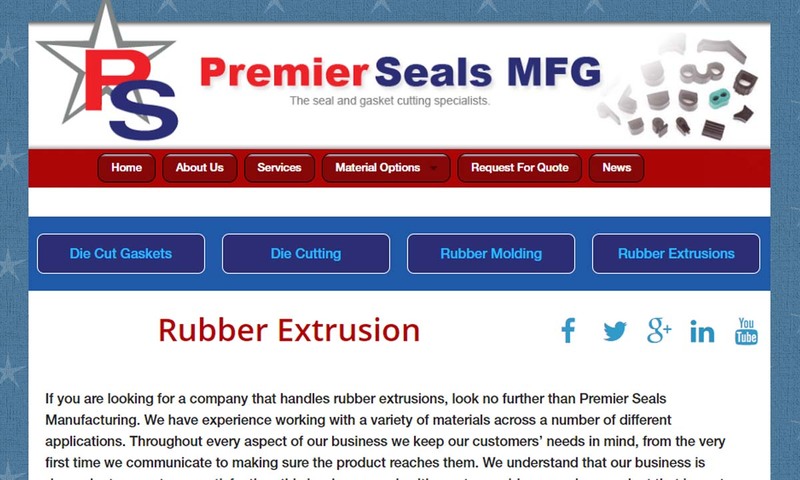 Seals made with these and other elastomeric materials are usually fabricated through extrusion, although Teflon seals are sintered in an oven from a powder form. Seals may also be made from non-elastic materials such as felt and leather. Some particular types of hydraulic seals (e.g. bonded seals) are made from metallic materials (including brass, bronze, aluminum, carbon steel, and stainless steel). All of the metal materials used to create seals may be plated or galvanized for added oxidation protection and strength. The adhesion between the rubber material and metal of a bonded seal is created via chemical bonding. 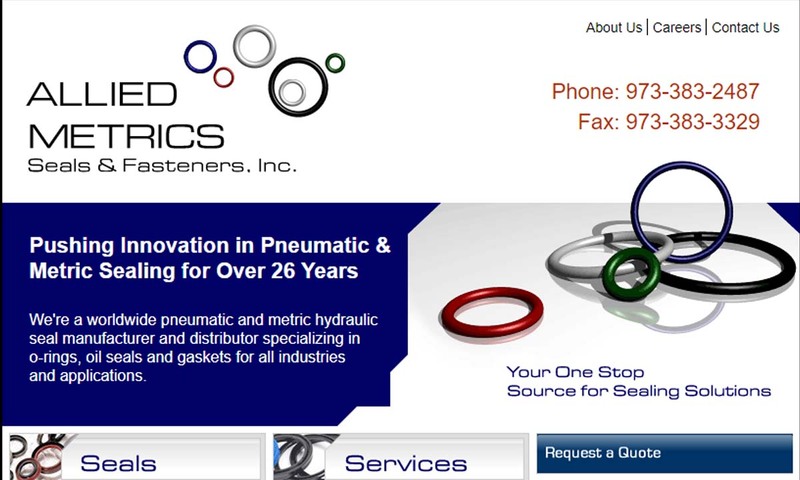 Hydraulic Seal – Allied Metrics Seals & Fasteners, Inc. Hydraulic seals are most often found in hydraulic cylinders, the mechanical actuators that convert hydraulic pressure (from oil, water, or another pressurized fluid) into unidirectional force for agriculture and forestry vehicles, construction equipment, and similar mechanisms. Usually, hydraulic seals are located on the cylinder head, on the rod shaft, or in the piston. 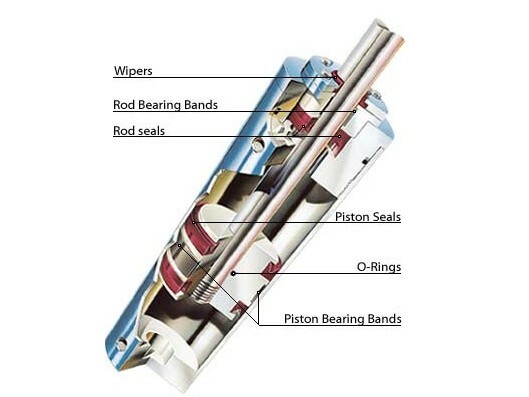 In these positions, seals keep fluid from leaking past the interface between the rod and head, from leaking to the outside of the cylinder, and from flowing across the piston. Hydraulic seals are divided into two main groupings: static and dynamic. Static seals are typically located in grooves and other confined spaces, where they act as gaskets. In this context, the term gasket refers to a mechanical seal that fills the space between two or more mating surfaces that do not have any motion between them and is held in place by pressure applied by the tightening of bolts. Although static seals vary by number and exact location depending on the specific cylinder structure, all of them serve the purpose of closing gaps between immobile surfaces. Static seals can be further broken down into groups of axial static seals and radial static seals. To achieve a secure seal, axial static seals must be squeezed between their upper and lower surfaces. Radial static seals, on the other hand, accomplish the same thing when they are compressed between their inner and outer surfaces. Dynamic seals, which are also known as shaft seals, seal gaps between two surfaces that do share relative motion. Types of motion they work in between include reciprocation, oscillation, and rotation. Reciprocating dynamic seals are seated within glands that hold relative motion. Here they move along an axis in between inner and outer surfaces. Most often, they’re used to power linear actuators, hydraulic cylinders, and pistons in internal combustion engines. Oscillating seals operate with shafts that rotate using a limited number of turns around its axis. Because of the frequency with which these shafts rotate, oscillating seals are usually made of a relatively hard material and have self-lubricating capabilities. Rotary seals are placed where a hydraulic device experiences rotational motion from a housing and a shaft. The specific operations of a hydraulic seal differ slightly depending on where the seal is located with regard to the hydraulic cylinder. The most common hydraulic seals are piston seals and rod seals, which are both cylinder seals with a flexible lip that rubs against the housing or shaft for improved sealing during linear movement. As such, piston seals and rod seals form the category known as lip seals. These types of seals are most often used to ensure the proper operation of revolving equipment and machinery. Piston seals specifically work by preventing leakage or fluid flow across the piston. Many piston seals are single-acting piston seals, meaning that they concentrate pressure on only one side of a piston. This concentrated pressure buildup enables the piston to travel the bore of a cylinder and the cylinder to actually move with maximum mechanical effort. As such, (dynamic) piston seals are extremely important to maintain the efficiency of a hydraulic system. Double-acting piston seals are able to concentrate pressure on both sides of a piston, thus driving the ram that the piston is typically attached to. In contrast to the dynamic types of piston seals just described, static piston seals seal the gap between the piston and the piston rod (rather than the piston and the cylinder bore). Rod seals specifically work by preventing external fluid leakage from the cylinder. They are usually single-acting and often enhanced with a secondary rod seal. Dynamic rod seals function in the gap between the piston rod and the cylinder head while static rod seals close gaps between the cylinder head and the cylinder bore. In addition to containing hydraulic fluid within the cylinder, rod seals help regulate lubrication fluid for the rod, the wiper seal, and the rod seal itself. There are several other common types of hydraulic seals usually found in hydraulic cylinders. Rod wipers, also known as scrapers or wiper seals, block contaminants from entering the cylinder. Some contaminants that threaten the operability of a hydraulic cylinder include dirt and moisture (among other foreign particles). Wiper seals remove these contaminants when they retract into the cylinder. Buffer seals enhance the function of the rod seal by providing a “buffer” against excessive internal fluid pressure. They also serve to protect the rod seal from any contaminants that do manage to find their way into the cylinder (such as metal chips). Guide rings are also known as wear rings since they serve dual purposes of centering the piston and piston rod while guiding them through the cylinder and preempting metal-on-metal contact. Wear rings can be found at both the rod and piston locations within a hydraulic cylinder. O-rings are unique in this list since they are identified primarily by their shape rather than by their location or specific function. As their name suggests, O-rings are donut-shaped and come in many different materials (e.g. rubber, silicone, fluorocarbon) and sizes (e.g. less than an inch to several meters wide). When these types of seals are mechanically deformed by pressure, they create very effective sealing barriers. Due to their low cost and relative simplicity, O-rings are the most common type of hydraulic seal on the market today. Beyond these common variations are more specialized types of hydraulic seals. Oil seals, which are called metric oil seals outside of the USA, are used with hydraulic oil and made with materials that allow them to resist breaking down or malfunctioning in the face of repeated oil exposure. Such materials include polyacrylate, silicone, Teflon, and a number of fluoroelastomers. In addition to preventing leaks, oil seals retain oil and other lubricants for rotary applications. Metallic bonded seals are characterized by the way they are stuck to metal washers. X rings (also known as quad or square rings) are, in essence, enhanced versions of O-rings. Their four-lobed design allows them to achieve up to twice the sealing power of normal O-rings with less mechanical deformation. X rings can be used both as static seals and as dynamic seals. Since hydraulic seals are so critical to the efficiency of hydraulic systems, they are applicable across a wide range of industries. Industries hydraulic seals serve include aerospace manufacturing, agriculture, automotive manufacturing, chemical processing, defense contracting, food processing, marine products manufacturing, medical and pharmaceutical products development, nuclear power, pulp and paper, and waste disposal. The specific applications of hydraulic seals are as diverse and numerous as they industries they are found in. Hydraulic seals can be found in construction equipment, agricultural machinery, brake devices, clean rooms, conveyors, mixers, presses, valves, and test equipment. Some hydraulic seals are made for very specific applications. Within the aerospace industry, custom seals such as silicone sealant strips serve to seal various hydraulic components within aircraft systems. Similarly, in the electronic industry, seals such as EMI shielding gaskets serve to prevent unwanted electromagnetic interference in various devices. Those considering which hydraulic seal solution is appropriate for them must take into account a few things. Although hydraulic seals are primarily designed to prevent fluid leakage, it must be remembered that hydraulic seals provide other important functions and can only be properly maintained under the right conditions. As such, the selection of a seal should not be made exclusively on its sealing capabilities. Rather, the best effort should be made to determine the overall operating conditions of your hydraulic system and choose the most effective seal which can operate under those conditions. One of the most important factors to take note of is the space within which the hydraulic seal will operate. This will affect the diameters of both the inner and outer seals as well as the housing bore and the dimension of the outer shaft. Similarly, interested parties must determine the diameter of the axial or radial cross section their application will require. Furthermore, purchasers of hydraulic seals should take note of vacuum rating, working temperatures, chemical compatibility (between the seal and the hydraulic fluid), highest and lowest working speed, and minimum and maximum pressure. An example of weighing these different factors can be seen in the hypothetical selection of O-rings. An important characteristic of O-rings is the compression set, or measure signifying how much an elastomer regains its initial thickness after being compressed. The compression set, in turn, is affected by temperature fluctuations, hydraulic pressure variations, and the exact nature of the fluid the O-ring is in contact with. Extremely high operating temperatures, for instance, may cause excessive O-ring swelling and the need for larger O-ring “housing” within the cylinder in order to offset this reality. It should also be noted that while all hydraulic seals are important, not every single one is equally important. In that sense, prioritization is important when selecting and applying different types of hydraulic seals. Maintaining internal pressure and preventing contamination are leading priorities in terms of properly operating a hydraulic cylinder. (Contamination is the leading reason for hydraulic system failure.) For these reasons, the rod and wiper seals of a cylinder are particularly important (since they maintain internal pressure and prevent contamination). If the proper considerations are taken into account, operators from all industries can expect reliable and efficient sealing. An experienced and trustworthy hydraulic specialist and/or supplier is worth finding to get help during the seal selection process. The best hydraulic suppliers will offer services such as proprietary or custom sealing materials, advanced documentation for various seals, and their optimal operating conditions, etc.